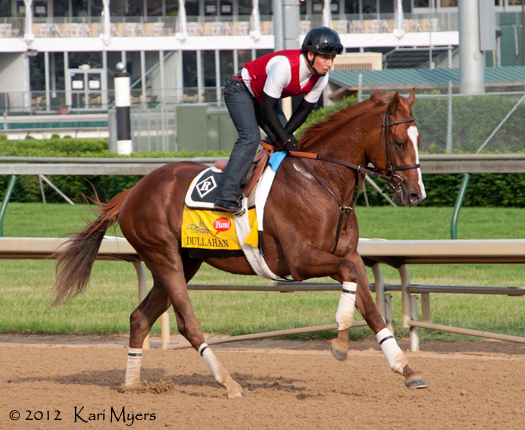 May 3, 2012: Dullahan on the track at Churchill Downs a few mornings before the Kentucky Derby. On October 20, 2013 the horse racing world lost a beautiful soul. Dullahan was euthanized in the early hours of Sunday morning after an acute bout of colic, officially diagnosed during surgery at Hagyard Medical Institute as a ruptured colon and resulting infection. There was nothing they could do to save him, and that breaks my heart. In a painful bit of irony, Dullahan was retired from racing just a week prior to his death and sent to unwind at WinStar Farm’s beautiful facilities in Versailles, KY while his owners decided where he would go for stud duty. I started looking through my pictures at that time for favorites I’ve taken of him over the last few years, thinking I might put together a retirement farewell. That wasn’t to be. Once I heard about his death, I put everything away for a week because it made me so sad to see him galloping around the track in photo after photo. My condolences to his connections: trainer Dale Romans, his staff, and all of his owners at Donegal Racing. I had the good fortune to meet one of Dullahan’s owners at Churchill Downs in 2012, the day before he ran 3rd in the Kentucky Derby. It was the end of the Kentucky Oaks race day and tired people were slowly filing out of the stands, but one rather tipsy gentleman in a bright green hat stood around the paddock chatting with us. He was so proud that his horse was running the next day in the big race, and he was ecstatic to find out that Dullahan was one of our favorites for the Derby. 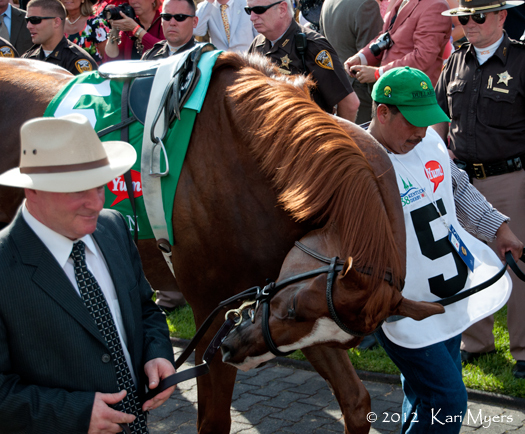 May 5, 2012: Saddled and ready for the Kentucky Derby. 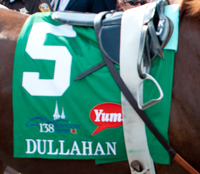 So from all of your fans whose hearts you stole, farewell Dullahan. 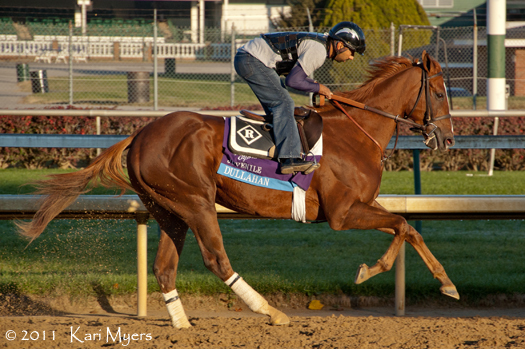 Nov 2, 2011: 2 year old Dullahan gallops in preparation for the Breeders’ Cup Juvenile. 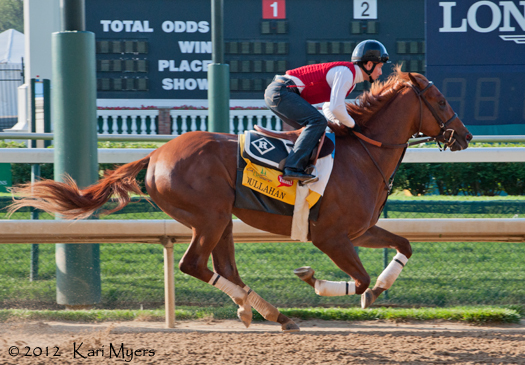 Nov 2, 2011: The two most handsome colts on the track during Breeders’ Cup: Dullahan (left) and Shackleford. 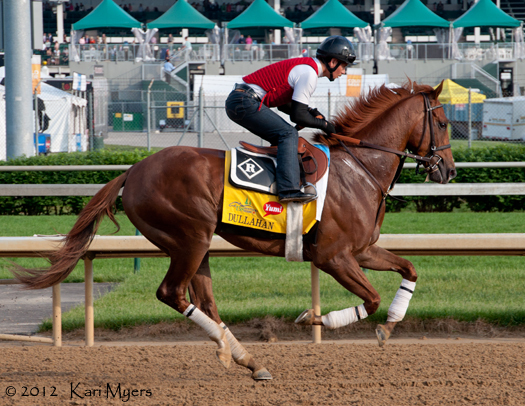 May 2, 2012: Dullahan gallops past the finish line in the morning. May 3, 2012: Bath time! May 3, 2012: Standing still or at a run, he was always so handsome. May 3, 2012: Working up a sweat in the morning. May 3, 2012: Ears pricked and paying complete attention to the crowd. 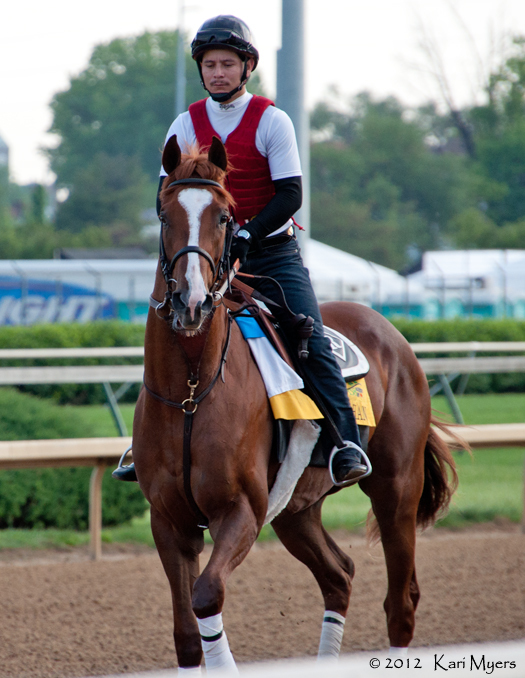 May 3, 2012: Dullahan cools out after a morning gallop. 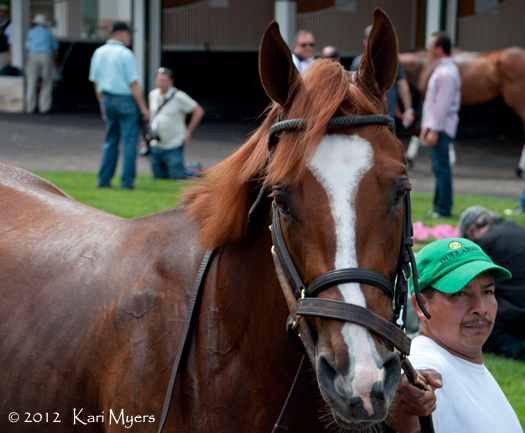 May 3, 2012: Dullahan paddock schooling. 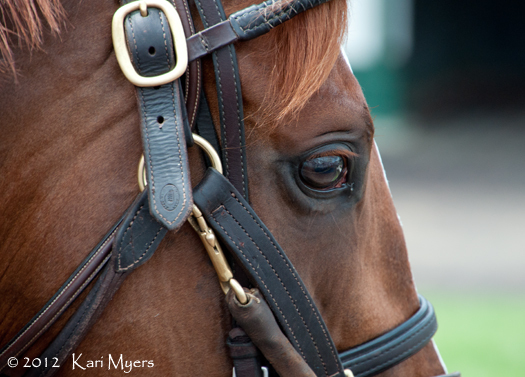 May 5, 2012: The chaos of the paddock before the Kentucky Derby. May 3, 2012: Those eyes! May 5, 2012: Ready to run. 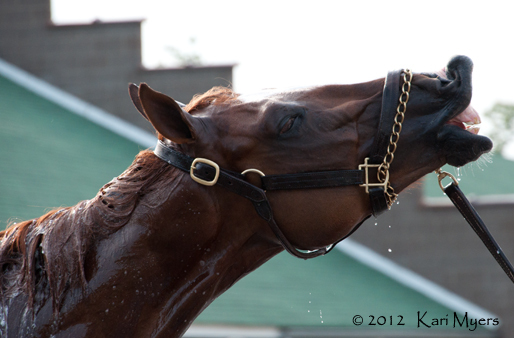 May 3, 2012: Dullahan enjoys a bath. 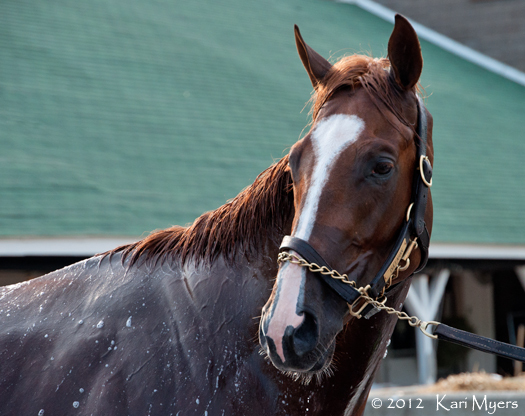 May 3, 2012: Even soaking wet, Dullahan is so handsome! A few mornings before the Kentucky Derby, we had to make a decision as to which barn to head to after all of the Oaks/Derby horses came off the track from their morning works. 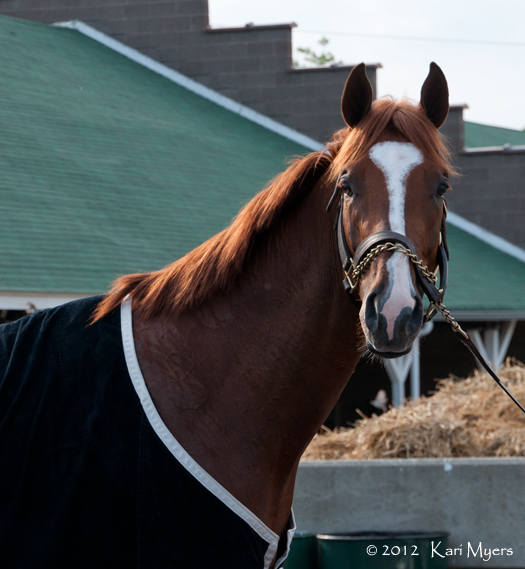 Since Churchill Downs sets aside a specific time for all of the contenders to go to the track (no other horses are allowed out while the Oaks/Derby horses are working), they all end up back at their barns at the same time. We decided to run to Dale Romans’ barn in order to catch a glimpse of Dullahan getting cooled out, but we had a little extra time to get to Bob Baffert’s barn as well. Derby week is so much fun! 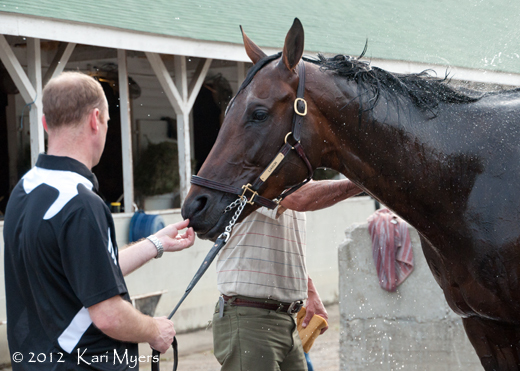 May 3, 2012: Bob Baffert’s Liaison takes his bath and all the cameras in stride. May 3, 2012: Laundry time, too. 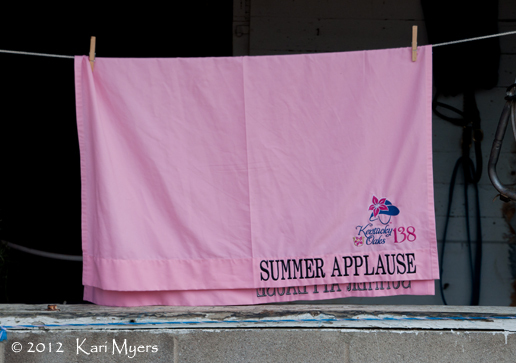 Summer Applause’s workout cloth is hung out to dry in front of Bret Calhoun’s barn. 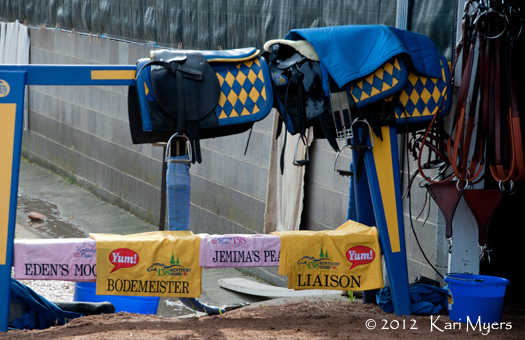 May 3, 2012: Bob Baffert’s barn was loaded for the 2012 Kentucky Oaks and Derby. 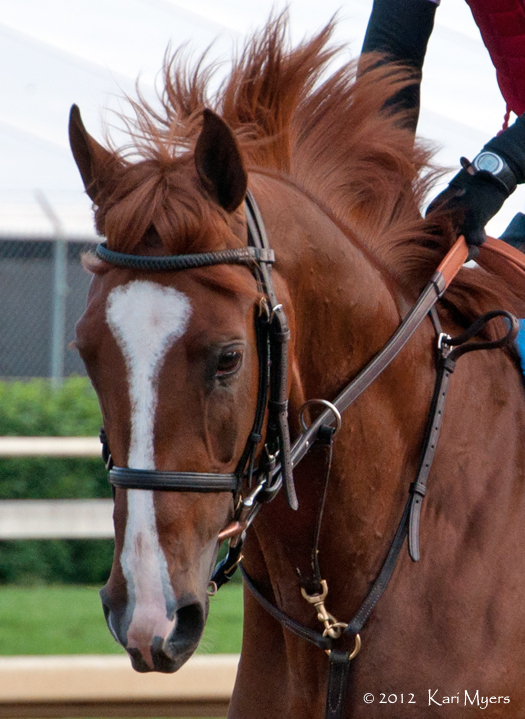 Dullahan is such a handsome colt. He’s proven to be quite a synthetic specialist, already winning three Grade 1 races on Polytrack. It looks like his connections are probably aiming for a start in Dubai, so it should be fun to see how he does as a 4 year old. Can’t wait! 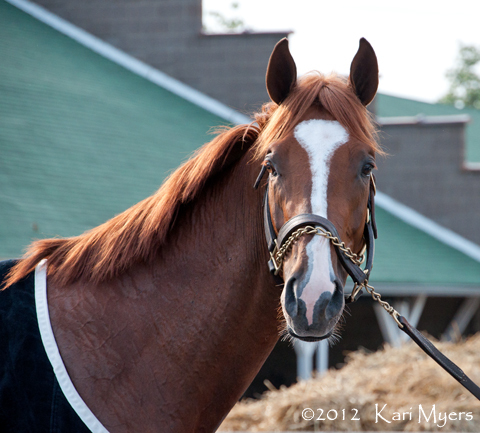 May 3, 2012: Dullahan at Dale Romans’ barn. 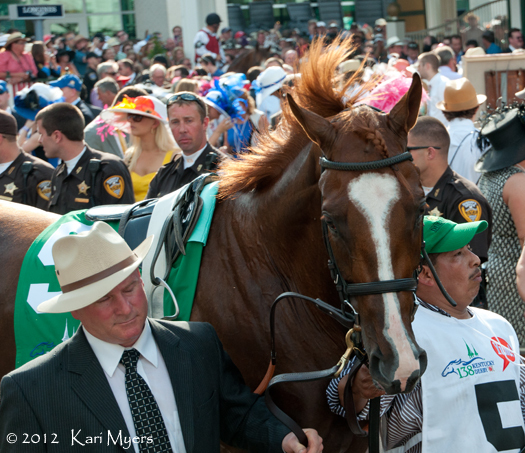 I think Dullahan is one of the more charismatic 3-year-olds of 2012. 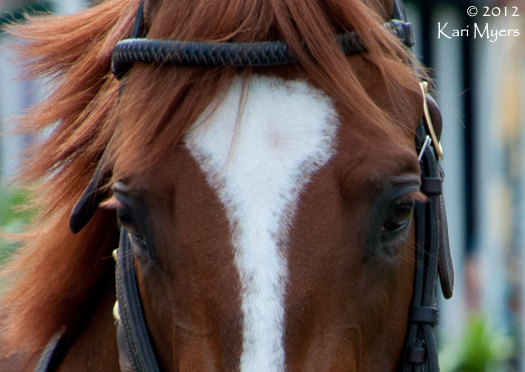 He is often seen on the track in the mornings with Shackleford, and they really do make a perfectly matched pair. 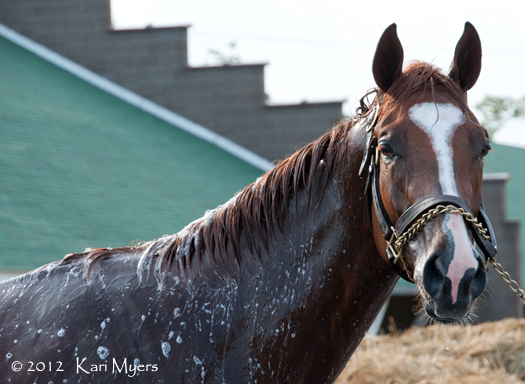 This photo was taken after his morning gallop at Churchill Downs, just a few days before the Kentucky Derby. Dullahan has had a rather frustrating campaign this year. He won the Grade 1 Blue Grass, came in a strong 3rd in the Grade 1 Kentucky Derby, and won the Grade 1 Pacific Classic against some solid older horses later in the year while setting a track record in the process. However, the problem is that his only lifetime wins have come on Polytrack, even though he seems to work well over dirt and turf. He’s never won on either of those two surfaces, and he’s run some less than stellar efforts on them. He may be the only horse whose sole wins have come in Grade 1 Polytrack races. I’m really looking forward to his 2013 campaign, though. If he grows up a bit and performs the way we know he can, it could be pretty exciting. Just look at how Romans was able to get Shackleford to blossom as a 4 year old. In any case, he’s a stunning colt. He’s by Even the Score out of the fantastic mare Mining My Own. This makes him a half-brother to 2009 Kentucky Derby winner and Canadian 2-year-old champion Mine That Bird. Just think about the odds that one mare would produce a Kentucky Derby winner and a third place finisher. Astronomical!